Main > September Open Perspective: What is Open Culture? As you can see through the features and interviews presented here, the ‘point’ of opening up culture is so that people can access and use heritage material easily. In terms of material from Europeana Collections, they can do that on an individual basis by downloading one item at a time, or for bigger projects, they can use an API to access the whole database, or a subset of their choosing. Want to make an educational app that focuses on uniforms from the first world war? Or a game that uses birdsong? Or design a range of T-shirts with art nouveau imagery? You can. Europeana has an open source API (another kind of open we love!) that gives access to all sorts of material from high resolution images of artworks in the Rijksmuseum to wildlife sound recordings. We made it open so that anyone – whether you’re a creative in a digital agency, a business start-up, an educator or a researcher – can work with an amazing range of cultural heritage material and do inspirational things with it. The Europeana API recently won the Best Data API award from API World 2017 – we’re quite proud of that. Art Up Your Tab – (one of Martijn Kleppe’s top picks – see his interview!) 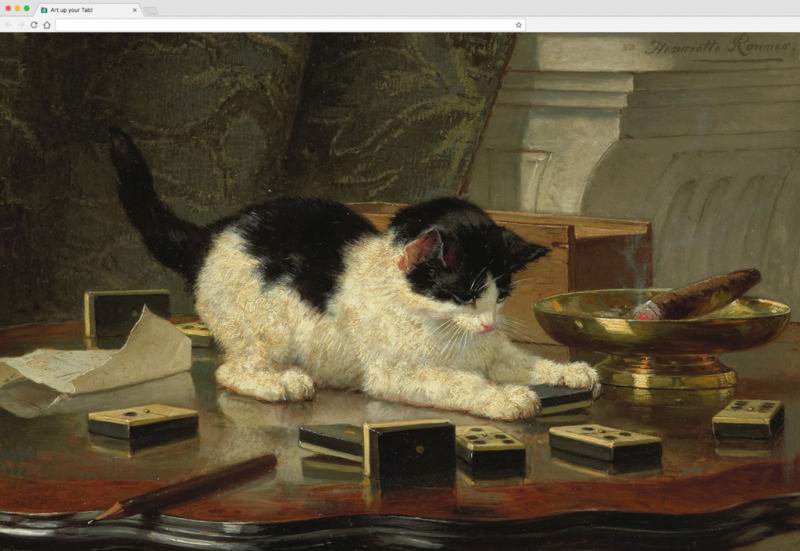 is a Chrome browser extension that shows you an inspiring artwork from Europeana Collections with every new tab or browser window that you open. It’s really quite addictive. FACES, from Art Stories, is a game for primary school-age children that encourages them to learn the basics of visual art using Europeana content. ‘Our apps, including FACES, serve as introduction to a great variety of themes: they provide content and inspiration for addressing kids about wider themes (such as art, or travelling the world)’, says Art Stories co-founder, Federica Pascotto. Children will be getting their hands on this app this summer when, in an agreement with Italian tour operator Alpitour, it’ll be used in a number of holiday villages in Fuerteventura! 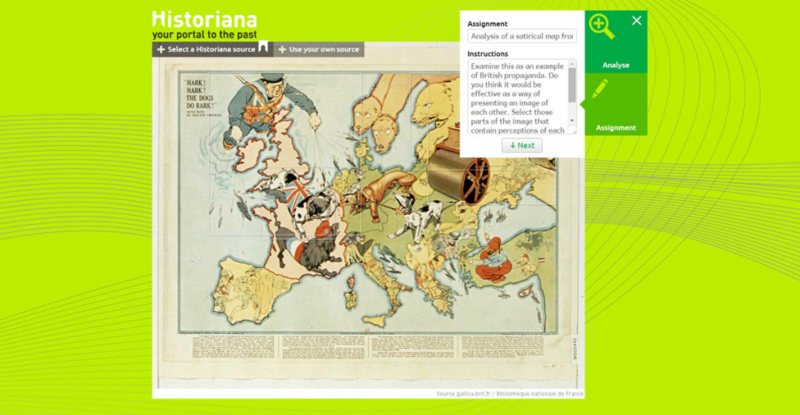 The Historiana Learning Section is a really visual resource that gives history teachers the chance to find sources, explore learning activities and then create their own in their own language. It is aimed at students (14+) and their teachers. World War I: A battle of perspectives, a Multi-Touch Book and related iTunes U course, is a great way to introduce students and learners to the events leading to the outbreak of the First World War. From letters exchanged between a German soldier and a British girl, to the ID card of a prisoner of war, the build up to the conflict is shown from a number of different perspectives. History is brought to life using unique historical materials and a series of interactive assignments. If you want to search for even more open culture, try the Creative Commons Search tool. It allows you to search a number of open repositories at once and recently included 470,000 images from Europeana- major works by masters of European art as well as photographs, prints, drawings, and more. The tool’s content includes February’s landmark release from Metropolitan Museum of Art as well as large collections of freely licensed images from 500px, Flickr, Rijksmuseum, and New York Public Library. Europeana’s new addition brings the number of searchable objects on CC Search to over ten million. And if you happen to be online in Korea and looking for something inspiring, you can find Europeana content through Gongu – a Korean language search engine for cultural content, supported by the Korea Copyright Commission. Discover many more applications of open culture on our showcase.